BITS Pilani will conduct BITSAT 2018 from May 16 to 31, 2018. The examination will be held in online mode, in multiple sessions. 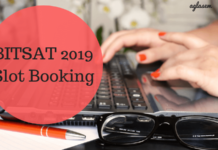 In order to appear for the exam, candidates need to do BITSAT Slot Booking. The booking could be done online. After the booking, the admit card is available from April 12, 2018. BITSAT is a university level computer-based test which is held by BITS Pilani for admission to Integrated First Degree Programmes at Pilani campus, K. K. Birla Goa campus and Hyderabad campus. Check more details regarding the BITSAT 2018 such as exam date, application form, slot booking, admit card, syllabus, exam pattern from this page below. Considering the past trends, among the three campuses, the cutoff is mostly the highest for the Pilani campus. It remained between 300 to 385 for all the courses in the institute. Check the complete schedule for BITSAT 2018 exam in the table below. Claim Refund: Click here to claim refund for candidates who did not report. BITSAT 2018 Slot Booking has started now. The candidates can do the booking from the link available above. Through BITS slot booking portal, a candidate can book test date and time because the center has already been allocated to all. Application Number, Gender, Date of Birth, and E-Mail ID details are to be entered to do the slot booking. Each day the exam will be conducted in two slots. The second slot will be from 2:00 pm to 5:00 pm. A candidate can choose any one out of these two slots based on the availability. An admit card will not be issued to the candidates if a slot is not booked by a candidate. 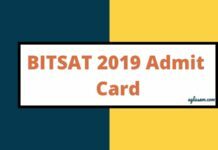 BITSAT 2018 admit card will release after the slot booking. It will automatically generate by the system. Admit card will contain the test date, center, and the slot booked by the candidate. Along with it, the detailed about the candidates will also be available. It is a very important document which the candidates should carry in hard copy format. With the admit card, the invigilators will not allow the candidate to appear for the exam. It is advisable to know the exam pattern of any examination before starting the preparations. It will reveal a lot about the question paper and what should be studied. Check the pattern of the examination from the content mentioned below. Exam Mode: BITSAT will conduct in Computer Based Mode. The Language of Exam: The medium of question paper will be the English Language. Parts in the Exam: The question paper consists of 4 parts and these are Chemistry, Physics, English Proficiency-Logical Reasoning and Mathematics / Biology. Question Type and Number: All the questions in the exam is of Multiple Choice Type and consist of total 150 questions. Answer Choices: For each question, four answer choices will provide. Marking Scheme: A question in the exam will carry 3 marks and it will be granted if a candidate will choose a correct answer. For choosing a wrong answer, 1 mark will be deducted. Know the distribution of question and marks in BITSAT 2018 from the table mentioned below. 12 Extra Questions in BITSAT: A candidate will have an option of attempting 12 extra questions if a candidate answers all 150 questions (without skipping any question). These questions will only appear on the screen if time is left. These extra questions will be from Physics, Chemistry, and Mathematics only. In each section, four questions will be presented. Also, remember once the candidate has opted for extra questions, he/she cannot go back for correction of any of the earlier 150 answered questions. As per BITSAT 2018, syllabus BITS Pilani will frame questions. The first thing is to remember is that BITSAT syllabus is on the basis of NCERT syllabus for 11th and 12th class. Hence, it is advised to all the candidates to refer NCERT textbooks for the preparation. To understand the level of questions of BITSAT 2018 syllabus does solve the sample test. The entire syllabus for BITSAT 2018 is as mentioned below. Note: Questions in the English section will be asked from Grammar, Composition, Verbal Reasoning, Logical Reasoning, Reading, Comprehension, Non-verbal Reasoning, Vocabulary. The M.Sc. programmes are 4-year integrated programmes after 12th. BITS does not award any intermediate B.Sc. degree. Udaipur, Mangalore, and Kohima three new exam centers have been added for BITSAT 2018 examination. The candidates will have to choose the exam center while filling up the application form and the allotment center will announce after the application process, on the due date. Ther list of BITSAT exam centers is as given below. How to Prepare for BITSAT 2018? 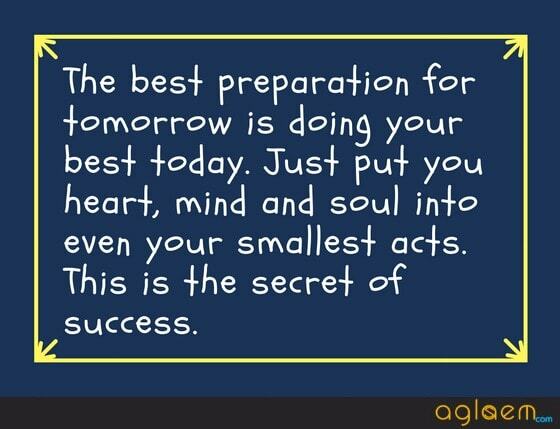 A good study plan – Managing your time efficiently will be possible only through strategic planning and regular practice. Make your own schedule and study the topics according to the syllabus and the weightage of particular topic. What are the Important Topics in BITSAT 2018? The score of the examination will disclose by BITS on the next day only. As the Institute will keep on conducting the slots, it will also keep on uploading the score of the candidates. Candidates will be able to check the result via Login. However, the actual result of BITSAT 2018 will announce by the institute later on. The result for BITSAT 2018 will be prepared on the basis of the score but the Institute will only consider those candidates in the merit list, who will score more than the cutoff. BITS-Pilani will release two merit list. One is BITSAT Admit List consist of the names of the qualified candidates. Another will be a waitlist. In the waitlist, the Institute will feature those candidates, whom it will call to fill the vacant seats. 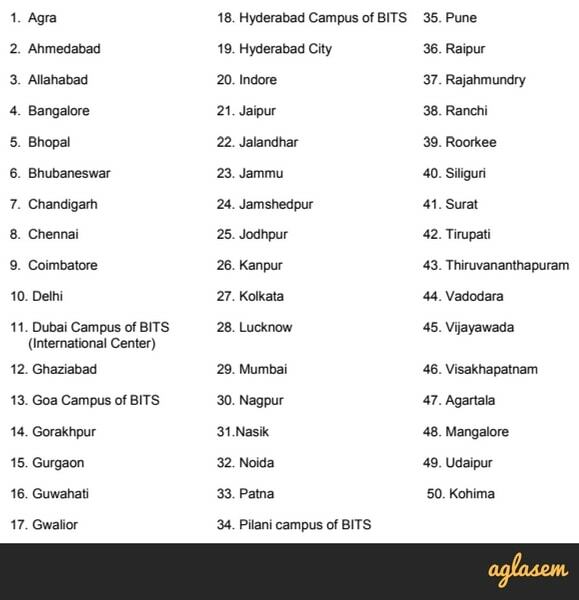 Right before the beginning of next session, BITS Pilani announces the cutoff for all the campuses. The candidates can check the last year’s cutoff to get an idea about how much score they need to secure in order to get admission in the desired course. The table shows that the number of candidates receiving marks equal to or more than 225 is much more than the candidates receiving marks equal to or more than 400 in all the 5 years. Almost, 33,700 people and that too only in 2017. Whereas, candidates obtaining marks in the range of equal to or more than 400 is the lowest. The application process has ended now! 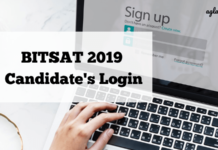 At BITS admission website a candidate can fill the application form for BITSAT 2018 is online. The aspirants must ensure before filling up the application form that they fulfill the desired eligibility criteria. The BITSAT 2018 Application Form is to be filled and submitted by online mode. The applicants need to fill up details such as Personal Details, Educational Qualification Details, etc. Also, they need to upload a scanned image of their Photograph and Signature as per the specifications. The next step is to make payment for the application fee in online mode via Credit Card, Debit Card or by Net banking. The candidates must pass the class 12th examination, with Physics, Chemistry, Mathematics, and English as core subjects. The aggregate score in Physics, Chemistry, and Mathematics should not less than 75% and marks in each subject should be more than 60%. The qualifying exam must qualify from a recognized Central or State Board. In order to attain admission through BISAT 2018 in B.Pharm course, the candidate should have cleared 10+2 examination with Physics, Chemistry, Biology, and English as core subjects. A candidate must score the 75% as the aggregate marks in Physics, Mathematics, and Chemistry along with 60% marks in each subject. Candidates with PCM can also apply. direct admission will provide to the School Board toppers to the institute. This will include toppers of State and Central Board. The toppers will get admission in the course of their choice. Note: If more than one attempt has taken by the candidate to qualify the class 12th examination then their latest performance will consider, provided this attempt as the full component of subjects/courses prescribed. If you have any queries regarding BITSAT 2018, please ask in comments below.